Bela Tarr from Hungary is renowned for his minimalist approach to cinema. 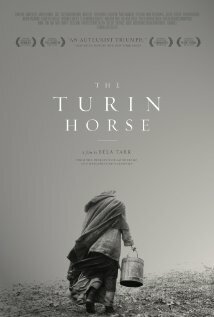 The Turin Horse is his last contribution to the art of cinema. This affirmation comes directly from the filmmaker himself. While many around the globe would want that to be a revocable decision, for the time being we have to take the auteur by his own words. The film opens up with a direct reference to a prominent incident in German philosopher Friedrich Nietzsche's life. The much debated incident had unfolded somewhat in this fashion: Nietzsche witnessed the whipping of a horse in the streets of Turin, ran to the horse, threw his arms up around its neck to protect it, and then collapsed to the ground. The film starts with a voice-over of Nietzsche's incident while the screen remains black. Does this signify the impending darkness? 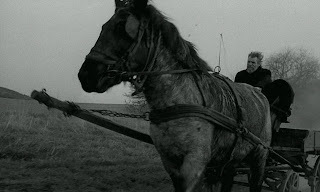 The film then documents six days in a stony house on a Hungarian plain occupied by the horse’s owner (Janos Derzsi) and his stoic-faced daughter (Erika Bok). The film presumably attempts to establish a connection between the horse in the Nietzsche's incident and the horse owned by the family. What unfolds next is the mundane existence of the father-daughter couple amid fast-approaching apocalypse. Tarr punctuates the in-between time with a chain of repetitious acts performed by the couple: eating the boiled potato that is their daily meal, the daughter helping dress and undress the father, the daughter fetching water from a nearby well, both of them peeling away skin of hot potatoes. Tarr does not draw conclusions, but sketches a marginal and tedious existence of humans on the screen. The family in the mean time makes a futile attempt to escape the impending doomsday scenario. The only worthwhile but helpless act remains for these characters is to wait out the imminent end of the world. While this turn of events makes the two characters look like helpless creatures waiting to be crushed upon by the willful massacre of nature, the horse also undergoes the same psychological pain and displays symptoms of an imminent physical breakdown. Despite the nurturing efforts by the couple, the horse is slowly nearing death and the wagon lies down in the darkness. All these images create a sense of hollowness in the mind of the viewer. Tarr's style of filmmaking may not be for everybody. His penchant for long takes (this movie was filmed with a total of 30 shots! ), stony black and white images, minimal use of dialogues, and using a handful of characters are what defines his senses of cinema. Tarr manufactures some beautiful images out of situations that are extreme in their ultimate consequence. The profoundness of the grim plot has been aptly captured in the scenes where the father/daughter sits by the chair in front of the only window of the house and silently stares out at the museum of natural destruction. These images of solitude will haunt you forever. Some of the tracking shots will stay with you much after the theater has lighted up. The background score is perfectly matched with the undercurrent of monotony and calamity. Tarr also makes subtle references to how different genders react differently to mundanity of life: while the daughter seems unfazed and stoic (when stripping away skin of hot potatoes), the father is visibly angry and unsettled. The Turin Horse is a magnificent watch by any measure; be it its cinematic images, aural experience, study of human characters in the face of most mundane existence and fundamentally the most disastrous event. The film won a FIPRESCI Prize at the 2011 Berlin International Fim Festival.